Being unable to attend my neighbor's birthday festivities due to generally poor weather, my children were mightily upset. 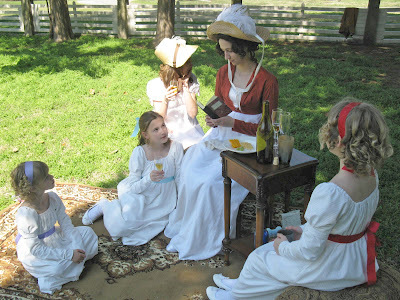 Therefore, on Thursday of this very week, we instead visited the home of General Daniel Smith at his estate, Rock Castle, where we had a glorious picnic on the grounds. Our outdoor dining was followed by a tour of the house. I was gratified to be able to find things that the girls would eat that would not stain their white dresses. Our picnic consisted of crackers and cheese, grapes and apples and three bottles of juice. The girls ate as though I had never fed them and a grand time was had by all in attendance. I asked Miss Waterman along, who has been in town on behalf of the Hegwood's for some time now. The poor soul knows no one in Nashville, to my knowledge, and I thought she might enjoy the diversion. Our picnic area. The dish atop the table is filled with orange and cherry flavoured jellies, the girl's favorites! Molly naps only briefly in the shade with a copy of the novel 'Pamela' on her face and her shoes off. The girls and I with Rock Castle in the background. Our guest, Miss Waterman, reads a passage from 'Pamela' to the amusement of the girls. The girls playing upon the General's Staircase. Their little gowns! How charming! Squee!